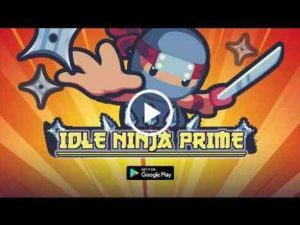 Idle Ninja Prime : Slice through the galaxy, hone idle ninja skills against the Shogun, tap to defeat space horrors, and carve out your revenge on the empire in this unique Idle RPG! Allocate skill points, collect unique items, and upgrade your way across space in Idle Ninja Prime! This is a Space RPG idle game like you’ve never seen. Battle ronin, train your idle ninja jutsu, tap to upgrade your skills and choose your abilities to survive the Shogun. Tap to attack, collect resources and use your abilities to idle through space and slay slavering savages serving the scheming shogun! Discover Galaxies with unique game-altering mechanics! Go on Missions to reclaim Planets and earn resources! Collect resources along the way to craft & upgrade new idle skills! Face off against the Space Mercs, Cosmic Cult Ninja, and Technocrat Alliance! Strategically select the best idle skills for each situation! Battle the fearsome Dark Shogun to survive and craft rare loot! Collect resources to unlock new abilities! Collect items and use them carefully to multiply your power at the perfect moments! A unique genre fusion – play as much or as little as you like! Your ninja keeps collecting resources without you! Return to tap and collect the loot and riches your hero collected while you were away! Lovers of retro RPG games and incrementals won’t be able to put down this idle ninja epic. Go on an epic tap quest, explore space to battle monsters, and defeat tough cosmic bosses. Master the Cosmos in Idle Ninja Prime! Enjoy it online or offline! Fixed a graphical bug affecting many devices – but the game performance is now worse!